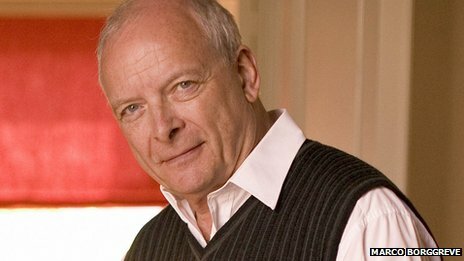 Christopher Hogwood was a huge contributor to my musical upbringing. One of the radio programmes I used to listen to as a child was "Pied Piper", on BBC Radio Three, presented by David Munrow, and The Academy of Ancient Music, conducted by Christopher Hogwood, made frequent appearances. So much for the background. Through one of the eccentric chains of coincidence that sometimes befall us, my husband encountered Christopher Hogwood on a train, they exchanged cards, and when he arrived back he'd received an email, gracefully thanking him for the welcome offer of his seat, wryly noting that this marked a watershed, "the first time I have been the recipient, and not the donor! ", and expressing some interest in what he did. Vaguely recognising the name, Colin showed me the card, and was more than a little startled to find me turning speechless with excitement and envy. Then we discovered that Christopher Hogwood was the current Gresham Professor of Music. Gresham College has no students, as such - it provides open lectures for the general public. So we went, and I had the opportunity to offer my thanks to Professor Hogwood for providing the soundtrack to my childhood. We enjoyed the lectures immensely, too, and continued to attend for the remaining two and a half years of his appointment. One of them - coincidentally, given on my birthday! - was the lecture on embellishment in the Baroque that I've been hoping someone would give for about twenty-five years. As all the obituaries have suggested, we found him consistently intelligent and scholarly, generous with his knowledge, treating his audiences - like his musical collaborators - as rational and intelligent beings. He brought in students from the Royal Academy of Music to perform the illustrations for his lectures, and often discussed with them - live - the finer points of technique and interpretation. It must have been terrifying for them, but I am sure it is something that they will now be looking back on with great pride. He attended one of Colin's lectures, and enjoyed it so much that over the subsequent dinner, he suggested that Colin should speak for Gresham College (which in due course he did). He even suggested - more than once - that "Juggling - Theory and Practice" should be set to music, a completely mind-boggling idea we've not yet been able to achieve. And unfailingly, when he saw us arrive for one of his lectures, he would turn towards us with a beaming smile and hand outstretched in welcome. He even introduced us, once, as "my most faithful attendees"! Yesterday evening I listened to Catherine Bott's tribute on Classic FM - a Hallelujah for Hogwood, as she phrased it. In a sense I was never aware of how revolutionary the "historically informed" movement truly was at the time - I was born after it became respectable enough for the radio. I know that Christopher Hogwood would have repudiated the notion that he could have been solely responsible for the revolution that took place, but his quiet intelligence, fine scholarship, and collaborative musicianship ensured that the revolution was welcomed and shared, and spread.